It’s not unusual to hear complaints about websites that are too focused on maximizing clicks — but it’s a little surprising to hear those words coming from Tony Haile, CEO of real-time analytics startup Chartbeat. After all, Chartbeat is arguably the perfect tool for monitoring the effectiveness of a click-focused strategy. In other words, instead of just trying to get as many clicks as possible, Haile is arguing that publishers should focus on attracting readers who will come back to the site again and again. For one thing, that’s the kind of audience that brand advertisers are more likely to value. Hopefully, that focus means creating content that’s genuinely worthwhile, either because it’s newsworthy, or informative, or entertaining — not just annoying clickbait. To encourage that shift in focus, Chartbeat is launching a new version of its Chartbeat Publishing dashboard for editorial organizations, placing a big emphasis on engagement (something that Chartbeat has been trying to emphasize for a while) and returning visitors. Haile showed me the redesign yesterday, and the new vision is reflected right at the top of the dashboard, where publishers won’t just see the familiar meter showing the number of visitors on their site, but also the percentage of users who are recirculating (i.e., those who aren’t just reading one page and leaving) and the average engagement time. A little further down on the dashboard, publishers can also see their visitors divided into segments — new, returning, and loyal. They can see their different traffic sources — not just who’s delivering the most visits but also which sites deliver visitors who will actually return (Chartbeat refers to this as the conversion rate). And when publishers look at the list of individual articles, they’ll see which ones are actually doing a good job of retaining readers and acquiring new ones. Other new features include more prominent placement for video analytics, more detailed mobile data that goes back 30 days, detailed traffic breakdowns by geography, and the ability to see the amount of traffic driven by specific tweets. Haile argued that the new Chartbeat will allow publishers to take “many of the same actions in pursuit of more meaningful goals.” In other words, a publisher could still use the data to decide what kind of content to focus on, but now they can prioritize that content based on a number of metrics, not just clicks. The updated version is supposed to go live for all Chartbeat Publishing customers today. You can read more here and play with a demo here. 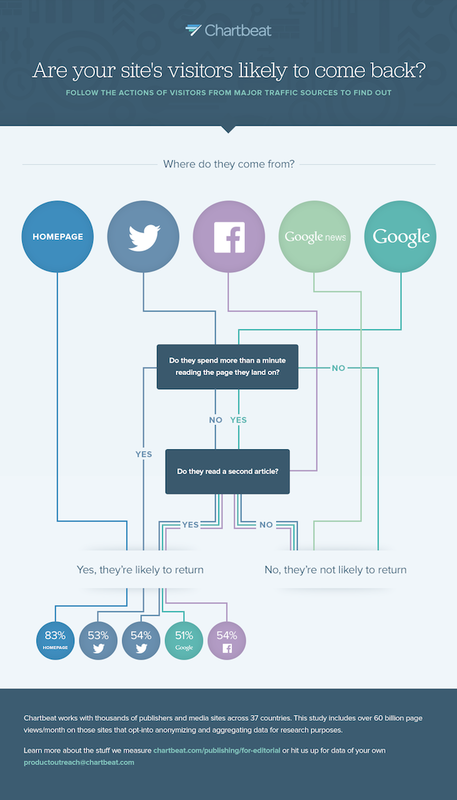 Oh, and here’s an infographic that the company created to break down the likelihood that a visitor will return to your site.